As far as big career milestones go, Brian Campbell couldn’t have planned it any better: an outstanding road win, a plus-2 rating in 23:17 of total ice time, a franchise record, and plenty of love from his teammates. The 1,000th game in Campbell’s NHL life was indeed perfect. Aside from an authoritative 4-1 victory by his Florida Panthers against Montreal, the blueliner was his usual steady self, seeing three-plus minutes on both the power play and penalty kill, and over 16 minutes at even strength. Wow 1000 games. Would like to thank @BuffaloSabres @SanJoseSharks @NHLBlackhawks and especially @FlaPanthers. Lucky to play this great game. If that wasn’t impressive enough, he also put his name in the Panthers record books by playing in his 374th consecutive game with the club. Soon after the final horn sounded, the 36-year-old and his teammates celebrated his big night, posing for a series of pictures that soon made their way onto social media sites. Less than 24 hours later, Campbell was still smiling. And as he pointed out, where he is was where Campbell hadn’t anticipated he’d be. The early part of his career certainly didn’t suggest that 1,000 games was in his future. Two and a half seasons in the minors before making it to the NHL ranks, healthy scratches – a long big-league life seemed to be a longshot. Even so, Campbell wasn’t going to give up without a fight. Campbell, who has also played for the Sabres, Sharks and Blackhawks over his NHL career, is also proud to be part of this Florida team. There is still plenty for the veteran Campbell - the 305th player to reach the 1,000-game plateau - to look forward to. He’s back in the playoffs for the first time since 2011-12 and will look to add a second Stanley Cup after winning it all with Chicago in 2010. Not bad for a player who once thought hitting the century mark in games would be a pretty big thing. Chicago Blackhawks defenseman Brian Campbell announced today his retirement following 17 seasons in the National Hockey League. Campbell will join the Chicago Blackhawks business operations department, assisting with various marketing, community relations and youth hockey initiatives. 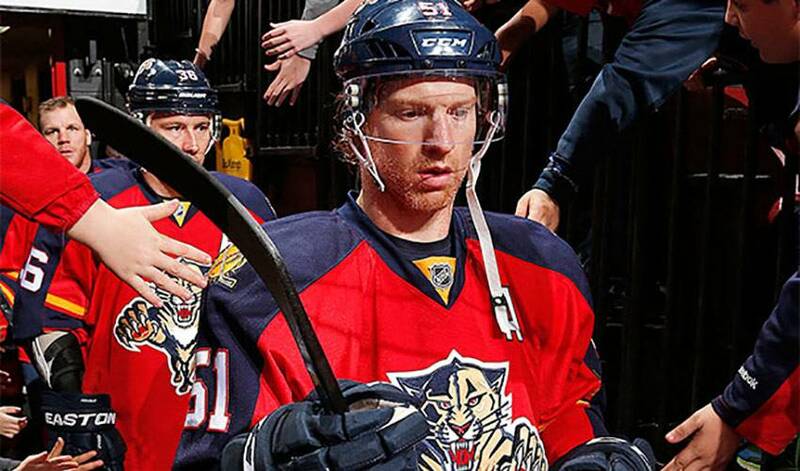 With NCAA March Madness in full swing, Brian Campbell got into the spirit by selecting four teammates – plus a head coach and mascot – who would join him on the court if the Chicago Blackhawks were allowed to have a squad in the tournament.